Eye floaters, also known as myodesopsias or muscae volitantes (in Latin, flying flies) are an ocular trouble consisting in the emergence in the visual field of black or white-coloured dots, spots, threads or cobwebs of different shapes, that move with eye movements. They appear most frequently when staring at very light surfaces or areas, such as white paper sheets or the sky, and they are a common reason for consultation with the ophthalmologist. 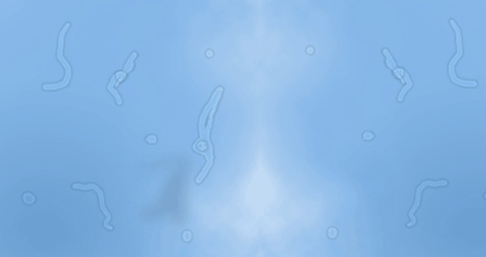 Floaters appear as a consequence of the emergence of opacities created within the jelly-like fluid that fills the eye, the vitreous humour, as this substance experiences natural changes over the time. Microscopic fibers within the vitreous tend to regroup and cast their shadow on the retina whenever the light passes through. Age, myopia, eye contusions, cataract surgery, capsulotomies (cleaning of the posterior capsule by means of a laser), and vitreous detachment are some of the main risk factors for the onset of floaters. In general terms, the onset of myodesopsia tends to be a normal circumstance that a significant proportion of population suffers at any point in their lives, especially in advanced ages or stress moments. This trouble is usually harmless. However, when the onset is sudden, and especially when floaters are associated with flashes of light (photopsias), or they stay motionless or considerably increase in volume, it is important to go the ophthalmologist. During the consultation, the specialist will examine the patient’s ocular fundus in order to rule out any serious diseases or injuries, as the onset of floaters may also be part of other more serious ocular troubles, such as retinal tears, uveitis, hemorrhages or eye tumors. vitrectomy, a surgery used in those cases where floaters involve visual impairment consisting in the replacement of humour vitreous by a saline solution. Nonetheless, both procedures carry risks, reason why they are only performed in very exceptional cases. In case floaters hide a more serious ocular trouble, its cause will have to be treated.